Today, a heartfelt song of faith – one that you must have heard if you are a Bangalee on the western side of the border, or a listener of Bangla folk music on the eastern side. Written by Kangal Harinath Majumdar, Hari Din to Gelo (Carry me Across, O Lord) is a soulful call to God by a seeker who is in the twilight of his/her life. Weary of the world on this shore, (s)he wishes to cross over to the other side – a realm truer and more profound than holy texts can convey. But lacking the piety that would allow him/her to cross the waters, the seeker can only appeal keeping fatih in God’s mercy – something that is beautifully expressed in this song. 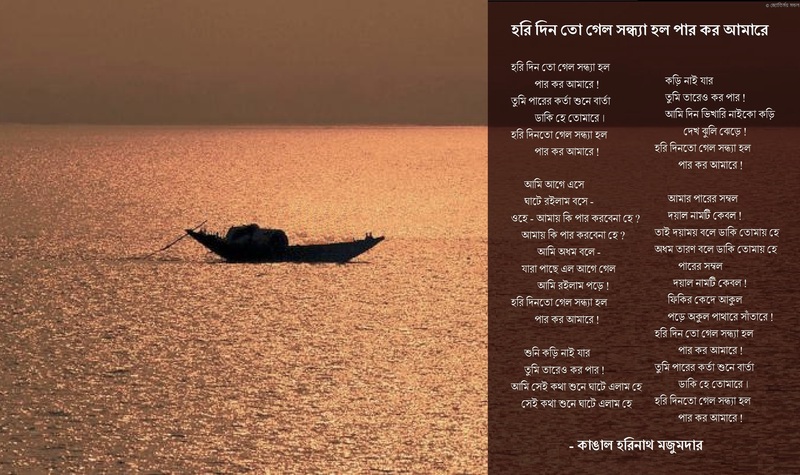 If you are familiar with Bangla devotional songs, you should find Hari Din to Gelo to be a classic Bangalee representation of God as a boatman. It should not be surprising – Bangla, after all, is a land crisscrossed by a thousand rivers. Who else could carry us away from that we want to leave, but a boatman? ওহে – আমায় কি পার করবেনা হে ? আমায় কি পার করবেনা হে ? তুমি তারেও কর পার ! পড়ে অকুল পাথারে সাঁতারে !